If you are new to the Cheatwell Squeeze Poppers, they are, in effect, foam ball firers. They are available in an assortment of shapes, colours and sizes. The basic principle however, remains unchanged. Each Squeeze Popper is a fun, attractive, hollow ball holder. Pop a foam ball into their hollows, give their middles a firm squeeze and watch as the ball is propelled several feet into the air. 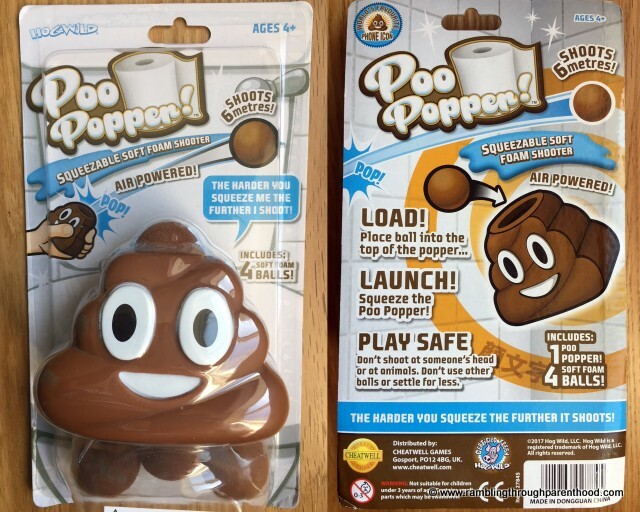 A bit of science underlies the Squeeze Popper craze. Increasing air pressure in a small enclosed space launches the foam ball projectiles. There are three new additions to the Cheatwell Squeeze Poppers collection. You have the poo emoji (! ), the unicorn and the monster. We have been trying out the Poo and the Monster poppers. 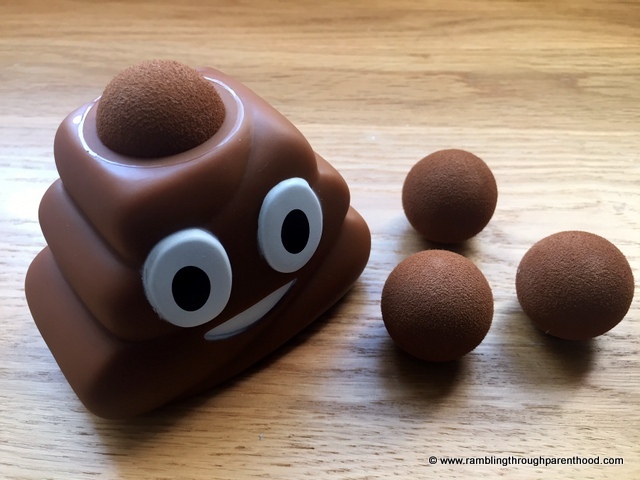 The Poo Popper (imagine the riot this caused when I mentioned it to my nearly-7 year old son) looks exactly like the poo emoji symbol. It is squat, brown with large smiley eyes. It comes with four foam ball projectiles. The Monster Popper on the other hand, is brightly coloured with garish yellow teeth. 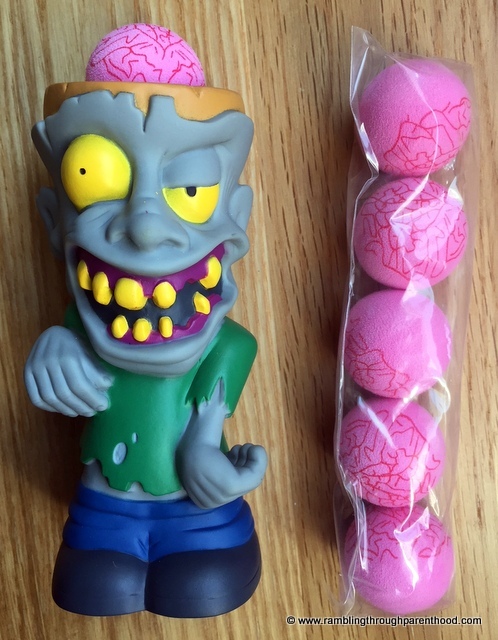 It comes with six pink foam ball projectiles that resemble a monster brain, complete with gruesome criss-crossing red blood vessels. If you think these Cheatwell Squeeze Poppers are just for children, think again. 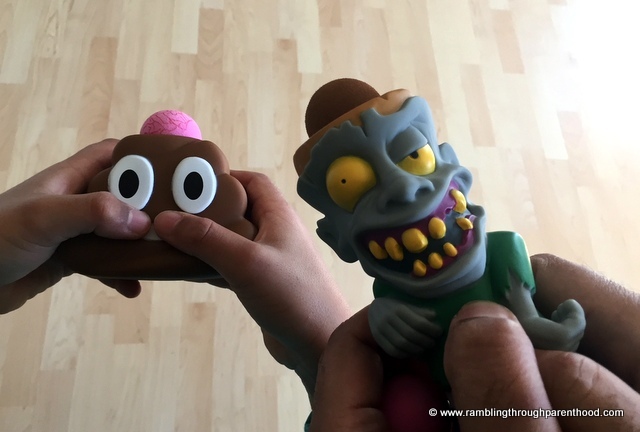 Once out of their packages, J armed himself with the Poo Popper and M got hold of the Monster. What followed was pure mayhem. There were foam balls flying around the living room as father and son engaged in Squeeze Popper combat. It didn’t take long for them to join forces and aim the poppers at poor, defenceless me! It’s a good job the foam ball projectiles are soft and painless and just bounce off you. I did enforce a ‘no faces’ rule, something that the manufacturer recommends as well. Do you fancy having a go with these Cheatwell Squeeze Poppers? You can buy them now at Amazon via the picture link below. You can also win a set of 3 on my blog competition. Just enter via the Rafflecopter below to be in with a chance. (You will receive a random selection of 3 Squeeze Poppers from the collection). Disclosure: This post contains review samples. All opinions are my own. This post contains affiliate links to make shopping easy for you. It doesn't cost you anything extra to shop through my links. It just means I will earn a few pennies towards the upkeep of this website.